An Important Safety Consideration for Pilots Aircraft performance and handling characteristics are affected by the gross weight and center of gravity limits. 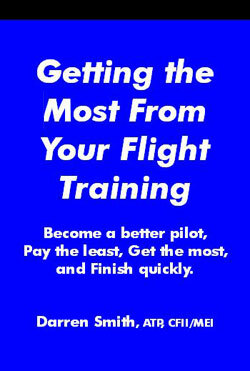 If every pilot were to understand and respect this fact, general aviation accidents could be reduced dramatically. An overloaded or improperly balanced aircraft will require more power and greater fuel consumption to maintain flight, and the stability and controllability will be seriously affected. Lack of appreciation for the effects of weight and balance on the performance of aircraft particularly in combination with such performance reducing factors as high density altitude, frost or ice on the wings, low engine power, severe or uncoordinated maneuvers, and emergency situations, is a prime factor in many accidents. This review of the fundamentals of aircraft weight and balance is provided to acquaint pilots with the effects adverse loading can have on aircraft performance. Greater understanding of the problem should encourage caution. The lifting capability of an aircraft depends upon the airfoil design of the wing, the speed at which the wing moves through the air, and the density of the air. It is the design of the aircraft wing that limits the amount of available lift and it is the available power from the engine(s) that likewise limits the speed at which the wing can be made to move through the air. The efficiency of the engine/wing combination is reduced when air is less dense than the established standard day (barometric sea level pressure of 29.92 inches of mercury at a temperature of 59°F). Therefore, every pilot should ascertain during preflight preparation that the aircraft gross weight is within safe limits for the intended flight, considering the aircraft performance capabilities. The total weight of baggage, cargo, and fuel load should be adjusted accordingly to provide an adequate margin of safety. Pilots must understand that in many general aviation aircraft it is not possible to fill all seats, load the baggage companment to capacity, carry full fuel, and remain within approved weight and balance center of gravity (c.g.) limits. In many four-place and six-place airplanes, the fuel tanks may not be filled to capacity when a full complement of passengers and their baggage is carried. It will be necessary to reduce the number of passengers or baggage weight if the proposed flight distance requires a full fuel load. Every pilot must consider how these characteristics would affect the aircraft in an emergency situation. Another consideration is high elevations, and/or hot and humid weather (density altitude) which is the subject of another publication in the Accident Prevention Program series. Balance refers to the location of the c.g. along the longitudinal axis of the aircraft. This is of primary importance to safety of flight. There are forward and aft limits beyond which the c.g. should not be located for flight. These limits are established by the aircraft design engineers to assure proper predictable aircraft control about the horizontal, vertical, and lateral axis. The operational weight and balance limits for each aircraft are contained in the aircraft owners or flight manual. This information may also be obtained from the FAA Aircraft Specification or Data Sheets available at most aircraft maintenance facilities. The weight and balance information for each aircraft must be amended when repairs or alterations have been made that effect a change in the aircraft empty weight or c.g. location (reference FARs 43.5(a)(4) and 91.31 (b)). To assure aircraft controllability during flight the aircraft must be loaded within the design weight and c.g. limits. A forward c.g. limit is specified to assure that sufficient elevator deflection is available at minimum speed as for landing. The aft c.g. limit is the most critical during flight maneuvers or operation of the aircraft. Aircraft stability decreases as the c.g. moves aft, and the ability of the aircraft to right itself after maneuvering will be correspondingly decreased. The aircraft will be highly unstable in gusting or turbulent air, making attitude and directional control extremely difficult. —Placement of baggage and cargo. —Assignment of seats to passengers according to each in dividual s weight. —Fuel load. Selective use of fuel from various tank locations during flight may aid in maintaining safe balance conditions. All aircraft are delivered with the empty weight and c.g. data which shall remain with the aircraft records. The aircraft owner is responsible to ensure that maintenance personnel make appropriate entries in the aircraft records when repairs or alterations are made to the aircraft. Unless the aircraft flight manual is amended when the aircraft empty weight or e.g. changes the pilot has no base line for loading calculations and decisions. empty weight—the airframe, engines, and all items of operating equipment that have fixed locations and are permanently installed in the aircraft. It includes optional and special equipment, fixed ballast, hydraulic fluid, unusable (residual) fuel, and undrainable (residual) oil. A simple and fundamental weight check should always be made before flight to assure that the aircraft useful load is not exceeded. If there is the slightest doubt about the loading, it will be advisable to calculate it by using actual weights and moment arms to determine that the aircraft is loaded within safe limits. Add total weight and check against maximum takeoff weight. If within limits add the the total moment and divide by total weight to determine loaded e.g. The loaded e.g. should be within the fore and aft c.g. limits shown in the aircraft flight manual weight and balance information. If not a few minor load adjustments may correct the problem. For your safety and the safety of your passengers check the weight and balance of your aircraft before each flight. Keep the aircraft gross weight and center of gravity within prescribed limits.